Space, comfort, and exquisite surroundings await you in Carlton Court. If you have a larger than average family, our stunning three bedroom flat situated in central Mayfair has everything that you could possibly wish for. However long or short your stay, you won’t find accommodation like this anywhere – and certainly not at our incredibly reasonable rates. Carlton Court is situated in Down Street, just off Piccadilly, and is within walking distance of just about everything you need when visiting London. Maybe you are only staying for a few days in order to take part in an auction at one of the famous auction houses here. Bonham’s is in Bond Street just a few minutes away and is the oldest British auction house, specialising in antiquities, decorative art, and vintage cars. Also in Bond Street is Sotheby’s which is famed far and wide, while if it is property that you are after Barnard Marcus is in Regent Street, and offers properties the length and breadth of the UK. Not very far away, in Victoria, is Christie’s which also sells the finest of artworks. Whether you are seeking luxury apartments in London for a couple of weeks, two or three nights, or several months, Carlton Court can help you. Our three bedroom flat has been furnished in the best possible taste by the owners who have decorated and furnished it as if they were going to live there themselves. No expense has been spared, and it is the work of a very fine interior designer, so you can be certain that you will be staying in the lap of luxury. The master bedroom in this flat is very spacious and has an ensuite bathroom. 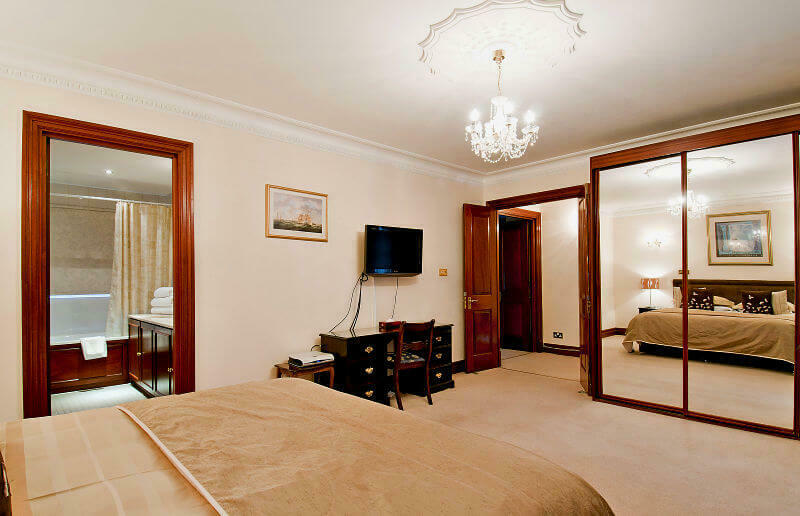 The second bedroom can be used as a double bedroom or twin bedroom as desired and has a second full bathroom. The third bedroom is a double with a bathroom and separate WC. The kitchen is fully fitted and has a washing machine, tumble dryer, and dishwasher, and there is a large reception room also.